…and music. 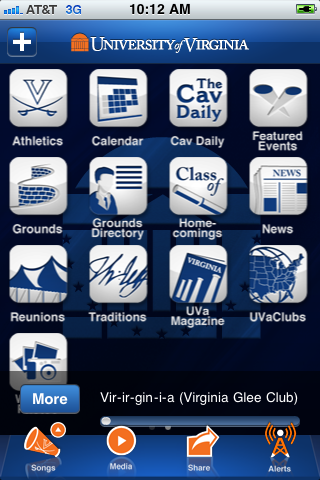 I was even more pleased to find the Virginia Glee Club‘s recording of “Vir-ir-gin-i-a” on the app’s list (along with marching band renditions of “The Good Old Song” and other Virginia tunes. While “Vir-ir-gin-i-a” seems an odd tune to represent Club–the recording from which the song was taken, Songs of Virginia, has many more familiar UVA related songs including the superb “Virginia, Hail, All Hail“–it’s actually an interesting tie to the past of both the University and the Glee Club. “Vir-ir-gin-i-a” has many connections to the Glee Club. Featuring an arrangement by long-time Club conductor Donald Loach based on a tune by Handel, the text is by UVa professor Arthur Kyle Davis, Jr. (1897-1972). Davis himself sang in the Glee Club shortly after the group’s reformation by Alfred Lawrence Hall-Quest, serving as secretary during the group’s 1916-1917 season (during which Club performed the blackface musical “Oh, Julius!,” a minstrel-show story of life in ancient Rome). Davis went on to serve in the Army during World War I; went to Oxford on a Rhodes scholarship; and returned to the University as a professor in the English department in 1923. And here’s where it gets interesting. Davis went on to his greatest fame as a folklorist, collecting three volumes of traditional ballad and folk songs through field research and becoming the archivist for the Virginia Folklore Society. The main thrust of his research was in showing that the English and Scottish ballads listed and enumerated by Harvard folklorist Francis J. Child (the “Child Ballads”) were alive and well on American soil for hundreds of years before their collection and numbering by Child. While influencing numerous Virginia faculty, including Paul Gaston, his most unlikely influence was on folk singer and song collector Paul Clayton, a student of his in the 1950s, whose song “Who’ll Buy You Ribbons (When I’m Gone)” was “re-gifted” by Bob Dylan for “Don’t Think Twice, It’s Alright.” Of course “Who’ll Buy You Ribbons” was itself “re-gifted” from an Appalachian song called “Who’s Gonna Buy Your Chickens” which Clayton learned from Mary Bird McAllister, a song that was collected by Clayton while he was Davis’s student. And “Vir-ir-gin-i-a”? Davis knocked it out in his spare time, apparently, in honor of the University’s sesquicentennial and premiered it himself at a meeting of the Jefferson Society. Loach arranged it for men’s voices for the 1972 Glee Club LP A Shadow’s on the Sundial, which financed the group’s first European tour, and it’s been in Club’s repertoire on and off since. 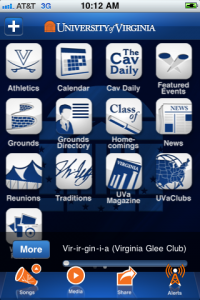 So while there are better known, and arguably better, pieces of Virginiana that could feature on future UVA app playlists, there are few that have so many interesting touchpoints to Glee Club, Virginia, and even pop music history. Thanks for picking up on this already. The UVA iPhone app is already rated Number 1 on the iPhone app store’s “New & Noteworthy” page. And I can see why. The Athletics feature works like ESPN’s ScoreCenter with push notifications. Charlottesville’s WillowTree Apps did a great job for its hometown university. UVA Today just put out a release on the iPhone app this afternoon – our Virginia app seems to be making a big splash with the New & Noteworthy Number 1 ranking for education apps in iTunes. It’s great for UVA fans and I’m glad a local company developed it. I’ll tell you what – the Associated Press picked up the Virginia App story because the app presents a first in education apps featuring augmented reality. The AP credited University of Virginia and the developer http://www.willowtreeapps.com with a pioneering effort on this one. Sara, Mike, Joe–were one or more of you involved in building the app? How about a few words about how the songs were chosen? No I was not but for starters the Good Old Song – our alma mateur – is choice and fitting for the Good Old App.